Current Doctor Who showrunner Steven Moffet is on record as saying that he views the show as a “dark fairy tale,” asserting that a combination of monsters, mythical characters, and a healthy dose of childhood terror make the show what it is. 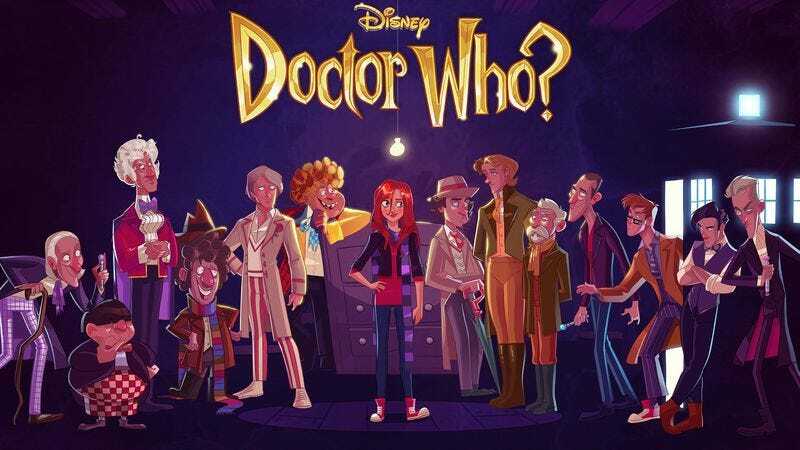 Artist Stephen Byrne has taken that idea and run with it, creating this gorgeous poster of all 13 Doctors—including John Hurt’s War Doctor from last year’s “The Day Of The Doctor,” and Peter Capaldi’s upcoming Twelfth Doctor—drawn in the style of Disney, assembled around Karen Gillen’s Amy Pond. You can click here to see a zoomed in version of the picture on Byrne’s Facebook page. It’s a lovely piece, even if it does take liberties with some of the characters’ iconic costuming (a quibble which Byrne mocked with another picture showing the characters with all the charming stylization stripped away). If nothing else, it’s one of the loveliest animated depictions of The Doctor we've seen since that time The Simpsons’ animators slipped him into the background of a scene.